make your plans to attend the Real Rod Run!! Since 1975, each August the E'ville Iron Street Rod Club has put on a rod run for street rod owners. It is held at the Vanderburgh County 4-H Center in Evansville Indiana. At the first event we had 44 registered street rods. Since that time the Frog Follies has grown to average over 4000 street rods each year. The event became known as the Frog Follies after the club had a bull frog race at the first event. We've had entries from Alaska, Australia, Canada, and all 48 continental states over the years. Since 2010 we can boast that the Frog Follies "is THE largest PRE 49 Street Rod event anywhere in the world!" We provide fun for the whole family with games, activities, and dances during the weekend. Our automotive swap meet is one of the largest in the United States and is held in conjunction with the rod run. The commercial street rod vendor area has over 600 hundred spaces and the used parts section of the swap meet area continues to grow each year. It has plenty of new parts to build your new street rod along with plenty of rusty parts and collectibles to satisfy you're your appetite for automobilia. Our concessions are owned and operated by the club so that you can keep your expenses at an honest rate and spend your money on other things you desire. We have collector Frog Follies items for sale on the grounds in addition to all the free items you get with your entry. It is also the only place on the planet that you can get your world famous Frog Follies Rod Run T shirt! Since 1975, with the help of several local groups the rod run has grown and with the continued support from street rodders from all over the country, E'ville Iron has donated over 2 million dollars to local charities.. We have provided scholarships for the past ten years so that High School graduates in our tri-state area can have a career in the automotive industry helping keep the street rod interest alive. Also for the past several years E'ville Iron has given away a new street rod roadster and chassis to a lucky participant. 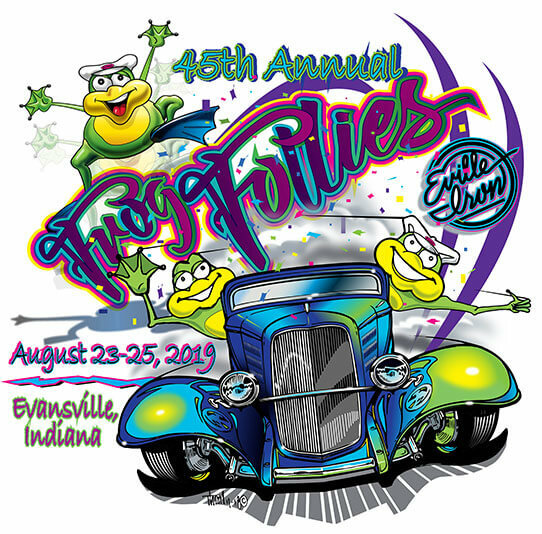 We the members of E'ville Iron Street Rods LTD. would like to invite you to attend this year's Frog Follies, as it is a great time to spend with your family and fellow street rod enthusiasts. And please remember; the Frog Follies is a rod run put on by street rodders -for street rodders. Copyright © 2018 - . E'ville Iron Street Rods Ltd Inc.
All rights reserved. Last update 2/13/18 .